To make sense of which race is perfect for you/me/everyone we know, I took to my office blackboard and sketched this flowchart. On a recent business trip, I asked the concierge at my hotel for advice about where to go running. “Are you training for a marathon?” he asked. Nope. I’m racing 5Ks, I told him. He gave me a puzzled look that said, but you look like a serious runner. It’s an idea that has become fixed in our culture: The marathon is a serious race. A 5K is a “fun run,” a jog, a walk in the park. I get it. Five kilometers, or 3.1 miles, is a distance that almost any healthy person can complete without too much training. As running races go, it’s a nice start. “Everyone thinks the marathon is the Holy Grail, when a lot of people should really be doing the 5K,” Jason Karp, an exercise physiologist and running coach, told me in an interview several years ago. Some people aren’t suited to long distances — their natural talents tend toward power and speed rather than endurance. And if you’re exercising for health and fitness, several studies suggest that moderate mileage, which is typical in a training plan for 5Ks, might provide a better way to get there. At the American College of Sports Medicine meeting in Boston this month, Paul Williams, a researcher at Lawrence Berkeley National Laboratory, presented findings from the National Runners’ and Walkers’ Health Study showing that running has a long list of health benefits — including reductions in BMI, improved cholesterol, reduced cancer risk and decreases in gallbladder disease, cataracts, cardiovascular disease, Alzheimer’s mortality and respiratory disease. But here’s the thing: More isn’t always better. At the same session, Duck-chul Lee of Iowa State University presented data showing that after a certain point, additional mileage provided diminishing returns. Williams’s research also found that the benefits of running might start to disappear at higher distances. People who exceed 30 miles per week may be at some increased risk of mortality relative to people who are at lower distances, Williams said, particularly if they have pre-existing health conditions. But it’s important to keep these findings in perspective: Among heart attack survivors Williams studied, runners never had a greater risk of a fatal heart attack than people who were sedentary. Training for and racing in 5Ks isn’t just a reasonable way to improve health; it might provide more reward per effort than training for a marathon. When FiveThirtyEight contributor Dan Engber recently wrote at Slate that the marathon is a dangerous, expensive and meaningless pursuit, my initial reaction was annoyance — why do people get such smug enjoyment out of disparaging our sport? Yet I concede that he has a point about the glorification of the marathon. The race isn’t the only means to health, fitness or even bad-assedry. (Ethiopian runner Muktar Edris just ran a 5K in 12:59.43 — that’s three 4:10 miles strung together.) 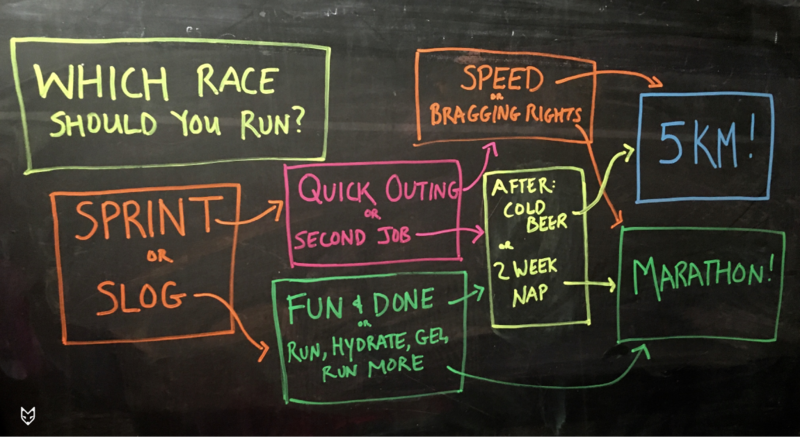 Typical 5K training plans call for something on the order of 10 to 30 miles of running per week or the equivalent in timed runs — in the optimal range for health benefits. Keeping mileage on the lower end comes with another bonus — a reduced risk of getting hurt. “Injuries are typically related to training volume,” said Michael Joyner, a sports physician and exercise researcher at the Mayo Clinic. That’s not to say that you can’t get injured training for a 5K — but it’s less likely, especially if you take care to gradually increase your mileage and intensity. So by focusing on the 5K, you’re optimizing health benefits and minimizing injuries, and if you’re deliberate about your training, you can maximize your fitness gains too. Training seriously for the 5K will get you close to your biological potential for aerobic fitness, Joyner said. “Seriously is the key though,” he said. The secret is high-intensity interval training, or HIIT — short periods of very hard efforts interspersed with easier recovery bouts. Studies show that these high intensity workouts produce greater improvements in VO2 max than the kind of long, slow workouts emphasized in many marathon training plans.1 Two-time U.S. 5,000-meter champion Lauren Fleshman has published a list of a dozen 5K-friendly HIIT workouts at Strava, most of which require no track, just a stopwatch. Most HIIT workouts are short, and that means you don’t have to get up at dawn to fit them into your schedule. “The bummer thing about marathons is that you have to put aside so much personal time to train,” said Fleshman, who ran the New York City Marathon in 2011 and finished 16th with a time of 2:37:22. “The 5K is so much more sustainable — it’s a moderate event that you can bring intensity to, without it wreaking havoc on your life.” You can train and still spend time with your family or friends, and you might even have enough energy left to enjoy their company. Still aren’t convinced? Consider this: Entry fees for a 5K are typically under $50 (I’ve done three this year that cost $25 or less), whereas the Boston Marathon costs $180 to enter. The international parkrun program holds timed 5Ks at local parks for free. You could spend four or more months training for a single race, or you can join Fleshman’s 5K revolution. Choose the 5K and you can easily race every weekend (even my tiny community has a 5K somewhere nearby most weekends). And if one race goes poorly, you can try again the next weekend. It’s a more sustainable plan. Rather than focusing on a one-time event, your training can become a normal part of your life — one that complements, rather than overtakes it. You may not get the bragging rights of having run 26.2 miles, but as your times drop and your pacing improves, you’ll get plenty of satisfaction. Instead of running to finish the race, you can run to master it. This is Strength in Numbers, my column exploring the science of sports and athleticism. Got feedback, suggestions or a news tip? Email me, leave suggestions in the comments section or tweet to me @CragCrest. Certainly many marathoners include HIIT in their programs, but they may be given less emphasis by runners whose only goal is to finish.